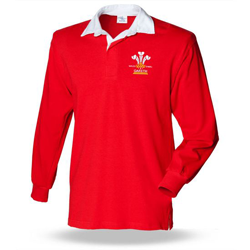 As every self respecting human being knows - the Welsh are Rugby mad and what better way to show your Welshness than wearing the Wales Rugby jersey. Some people my wear it on a daily basis (which is their prerogative) however on International day it is required attire. 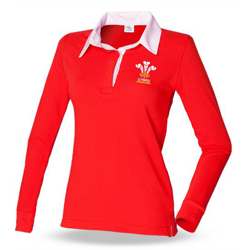 So for the truly Rugby mad - we also stock a range of Welsh rugby T shirts for both men and women allowing you to support the welsh national rugby team by wearing their colours with our FAB replica welsh rugby shirt range. Available in all sizes from Infant, children's, Ladies and men's. 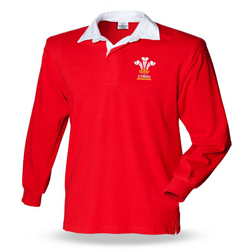 In addition to our Wales and Cymru variations for our Wales rugby shirts we have also recently launched a range of personalised welsh rugby shirts which allow you to add a name or text of your choosing to the rugby shirt. These personalised welsh gifts make excellent presents for any welsh rugby supporter. Please be aware that personalised items cannot be returned unless faulty so please make sure that you get the personalisation and sizes correct before ordering. In time we hope to add a few more design variations to our rugby shirt range - the next one on the drawing board is a retro 3 feathers design so if you are looking for a bit of vintage look this one should be for you. So ensure you drop by from time to time or like our Facebook page to stay up with the new releases. Finally, as per normal, if you would like to contact the welsh shop just use the contact us link at the bottom of the page.